In a nutshell, marketing automation allows you to design campaigns that gently lead customers to your checkout through a wide variety of ways, not just one traditional sales funnel. You set up the system and the system works as a marketing manager for each customer. This article will walk you through the decision-making process to determine if marketing automation is right for your business. Some eCommerce platforms offer cart abandonment support for an extra fee. You may already be paying for a landing page builder and a webinar tool, plus your existing email service. Answer: Unless you're already using an all-in-one tool, your current technology does not do the same thing. One of the biggest issues with new technology and software is learning how to use it. Sure, it seems simple in all the promo's but you can never figure out how to use it with calling support. Twice. The majority of marketing automation platforms are easy to use. For example, GetResponse has an easy to use drag and drop platform that any tech savvy person can use. 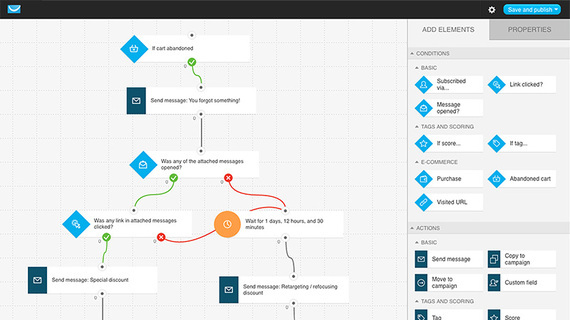 You can create a workflow for your campaign like the one below. You simply drag over the element based on the customer's action. Did they open this email? Yes sends them one way, and no sends them another. Answer: You don't need to be a tech wizard to figure out how to build your own campaign. Just choose a service with a simple interface. This is the bottom line for many businesses, especially those on the smaller size. Before we get into exactly how much marketing automation costs, it's important to figure out what you're already paying for. Answer: You can find reliable marketing automation for as little as $75 per month for up to 10k contacts. Depending on what you may save by combining your online marketing into an all-in-one tool, you may actually save money! Everything I've already said about marketing automation software is good information. Yet, that's not really what you need to know. Instead, you need to know what this kind of system could do for your business. This information tells us a few things. One of the most important is that qualified leads are one the most essential element of the sales process. And if the majority of business communication will be done through technology (no personal contact), then we need to set up systems that support that trend. The bottom line is that marketing automation can capture essential qualified leads, increase your profits, and decrease overall marketing costs. Instead of scoffing at yet another new marketing system or amazing software platform, marketing automation is definitely a trend you should jump into sooner rather than later.